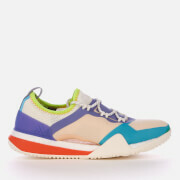 Women's lightweight adidas running trainers; designed in collaboration with English fashion designer, Stella McCartney. The 'Ultraboost X' sneakers combine high performance with environmental awareness to create a unique shoe. The striking design shows Stella McCartney’s love of animal prints with a leopard print pattern on the midsole. Lightweight and flexible, the Primeknit upper utilises yarn spun from Parley Ocean Plastic™, a material made from recycled waste that has been intercepted from beaches and coastal communities before it reaches the ocean. Offering utmost comfort and support during wear, the trainers' sock-like upper provides optimum fit, while an elastic band closure increases support. Equipped with Boost cushioning and a moulded heel counter for a natural fit and optimal movement of the Achilles. 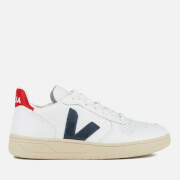 Developed with a Torsion System between the heel and forefoot for a stable ride.